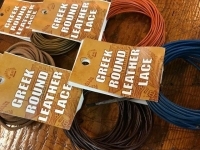 1.5mm Greek Round Lacing 5Mtr Available in a variety colours. Colours are subject to change without notification. 1.8Mm Greek Lace 5mtr available in a variety of colours. Colours are subject to change without notification.